WHAT RHYMES WITH NGAPARTJI? NGAPARTJI! at News Aboriginal Art Directory. 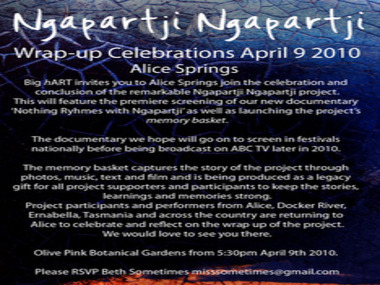 View information about WHAT RHYMES WITH NGAPARTJI? NGAPARTJI! WHAT RHYMES WITH NGAPARTJI? NGAPARTJI! It's hard for me to think that Ngapartji Ngapartji (freely translated from Pitjantjatjara, "I give you something, you give me something") is concluding. I never had the opportunity to see the stage show, Trevor Jamieson's personal and yet epic history of the colonization of Pitjantjatjara lands from the first signs of intruders through the aftermath of the Maralinga atom bomb testing. Everyone I know who did see it thought it an amazing and most affecting piece of theatre. Perhaps the documentary mentioned in the announcement above will give me a taste of it someday.